A night full of promise 7 p.m. Oakland Voices staff and a couple of community correspondents gathered in the East Bay Times foyer, found a space and learned that pizza was ordered; we chatted, and joked across the room as the big screen was being installed. Yes, it was finally election night and in an hour the California polls would close. While tired of the incessant telephone calls and mountains of mailers, I was ready for a decisive statement from the American people. Suddenly, silence. Early presidential returns were being broadcast, races from across the country were being called and some states were undecided because the race was so close. Me, I was calm. Too early; I thought it would be a long night. We wouldn’t know the results until after the western states’ ballots were counted. Pizza arrived, last minute instructions were given and at 8 p.m., in teams, we headed to our respective headquarters. The streets of downtown Oakland were alive. Warmer than usual, the night was full of election-watch parties up and down Broadway. We were off to see who won – the beverage industry or the local advocates in Measure HH. The two sides were described as a “soda tax” vs. a “grocery tax;” it was a confusing scenario for many. I looked forward to learning which side Oaklanders believed. My partner and I had a strategy—she would cover the facts to help our readers understand the depth and unique features of the measure and I would learn who supported the measure and why. How did this unusually diverse coalition of 150 plus organizations work together? 8:30. Oh what a night. 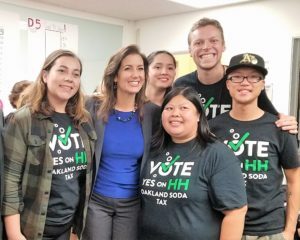 Early results indicated Measure HH leading two- to- one over big soda; similar measures were also leading in San Francisco and Boulder, Colorado. The main room of the campaign celebration was electric. Speakers included Vice Major Annie Campbell Washington, strategists and supporters. Cameras were snapping and of course selfies were taken. Larry Platt, campaign strategist, mentioned the young TOLA Fellows who were the spirit of the campaign. Ah ha, my first lead of who to interview. What a jubilant place. Asking around the room about who the fellows were, I saw a family come in and I thought I recognized one person. I made a beeline to the family. I interviewed the three generations in the family and returned to find a fellow. As my interview progressed with one person, a question would prompt an introduction to another person and I proceeded easily to another interview. I was moved by the authentic passion displayed by supporters who graciously shared their personal story of why this measure is important. I was excited and people kept entering the headquarters. A jubilant Mayor Libby Schaaf bounced in, hugged the TOLA Fellow and me as we were closest to the door. Measure HH Headquarters seemed like the happiest place in Oakland. However, by 9:15 p.m., the aura of those entering seemed to signal impending doom – the national results were looking like an upset and looking more and more likely that the next president was not going to be a woman. 9:30 p.m., the residential streets of Oakland were deserted. As I drove home, I turned off the news that I did not believe and drove in silence. It was a long, lonely drive home, still hoping to hear real news in the morning. Several days later, I was just beginning to accept the results and implications for the Supreme Court. What is next? No more time. Two minutes to nine. Time’s up. America spoke. Good stuff, Monica! I liked the use of time! I liked the ebb and flow of the article and the way it ended.